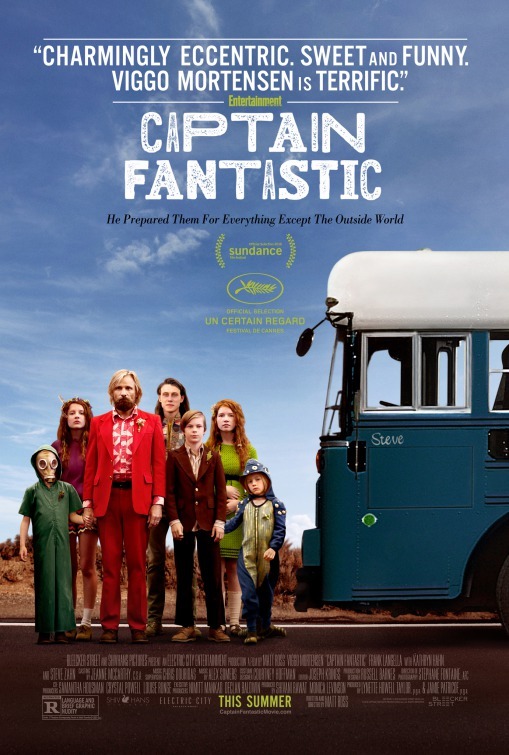 Matt Ross, the 46-year-old writer and director of CAPTAIN FANTASTIC, is a memorable character actor with a flair for eccentric roles. On HBO's "Big Love," he played Alby Grant, the murderous, closeted gay son of a Mormon cult patriarch. Ross's childhood gave him a natural affinity for stories about nontraditional sects. He lived with his "hippie mom" in nature communes in California, sleeping in a teepee. Yet in interviews, Ross insists that CAPTAIN FANTASTIC, which stars Viggo Mortensen as Ben Cash, a father of six raising his brood "off the grid" in the forests of the Pacific Northwest — is not autobiographical. In fact all writing, and all art, is to some extent autobiographical, especially that which rhymes so musically with the artist's life. This movie dramatizes the experiences of "back-to-the-land" family life from multiple angles: the father's view (he believes he's raising superior intellectual beings who are prepared to meet any physical challenge); the children's reactions (ranging from contentment to rebellion); Ben's in-laws' opinions (outraged). That the movie has no particular opinion about whether it's good or bad to raise your kids to slit deer throats and eat their bloody entrails, perform dangerous rock-climbing feats, and celebrate Noam Chomsky's birthday with cake and presents reflects filmmaker Ross's ambivalence about his own background. Some are praising the movie's equivocation as "nuance." Others might call it wishy-washy. The lifestyle of Ben and his brood is presented as a pastoral idyll with savage elements, like a manhood rite that includes the aforementioned deer-killing and offal eating. Their lives include a deep appreciation of nature, joyous music making around an open fire, and the reading of serious literature (George Eliot, Doestoevsky, and an unassigned foray into Nabokov). Ben and his wife have given their children unusual names: Kielyr, Vespyr, Zaja, Rellian, Nai. Ben, who must be quite the genius, is a stern father and demanding home-school teacher who insists that the children speak properly and learn subjects deeply. Each child has mastered several languages, including Esperanto. They are also well steeped in Marxist dogma; Ben has instilled in even the youngest tykes a deep cynicism about capitalism and imperialism. One of the youngest children has decorated his lair with tiny animal skulls, which he says portray Pol Pot's massacres. Ben's wife, Leslie, is not around, having been hospitalized for bipolar disorder. Early in the film, Ben learns that Leslie has committed suicide, slitting her wrists in a psychiatric facility, one presumably with lax supervision. It's Ben's sad duty to tell the kids their mom is dead and reassure them that "Nothing is going to change." Sadly, that isn't the case. Ben's wealthy father-in-law, Jack (a scary Frank Langella) forbids Ben to attend the funeral, even threatening to have him arrested. Ben and brood decide to defy the old man. The family board their converted schoolbus (named "Steve," it evokes memories of "The Partridge Family") and head to New Mexico, having interesting culture-clash encounters on the road. As he drives the family past shopping centers on the highway, Ben sneers at the consumerism reflected in the landscape: "Frenzied shopping as the chief form of social interaction." Shoplifting from a supermarket, as the Cash family do at Ben's direction, is apparently less of a moral hazard. When one of the daughters balks at shooting a sheep (with bow and arrow) for their dinner, Ben reluctantly hauls the children into a restaurant, where they are baffled by the presence of "fat people" and menu items like Coca-Cola ("poison water," Ben clarifies). All that book-reading has left the kids as benighted as newborn babies. It's a bit of a stretch — to have never imbibed a Coke is one thing; to have never heard of it is another. The most interesting scenes involve the culture clash between Ben and his home-brewed brood and Leslie's sister, Harper (the excellent Catherine Hahn) and brother-in-law Dave (Steve Zahn). The conventional couple try to accommodate their loony in-laws, but eventually Harper speaks her mind, accusing Ben of child abuse. "They need to go to school and learn about the world!" Ben pushes back, demonstrating how much smarter his kids are than Harper 's by having his kid deliver an eloquent disquisition on the Bill of Rights. The real showdown, however, is between Ben and his father-in-law. Ben and the children, dressed in tacky thrift-store clothes, crash the funeral, where Ben makes a fiery anti-religion speech before the assembled mourners and is thrown out at the direction of the father-in-law. A tug-of-war begins, and escalates, over custody of the children. One of the kids turns against Ben, blaming him for Mom's suicide. He decides he wants to live with his grandparents. The oldest son, Bo (George MacKay) wants to attend an Ivy League college, which Ben views as a betrayal. One of the girls is injured in an ill-advised stunt of Ben's devising, and Ben, who is visited in dreams by his dead wife (Trin Miller), starts to wonder if his ideas hurt his wife and are harming his kids. The screenplay's dialogue is uncommonly intelligent, and the movie is directed and edited with considerable verve. Mortensen is sensitive and persuasive as the conflicted patriarch. But there are nagging omissions and lapses of logic. What was Ben doing before he and Leslie dropped out? Leslie, we're told, was a successful lawyer. Ben says going native was an effort to help combat her depression, a strange idea. Stranger still is a midnight grave robbery and celebratory funeral pyre. That these ghoulish, wildly improbable acts are portrayed as spiritually uplifting is evidence of a certain disconnect with reality. 3 out of 4 stars.